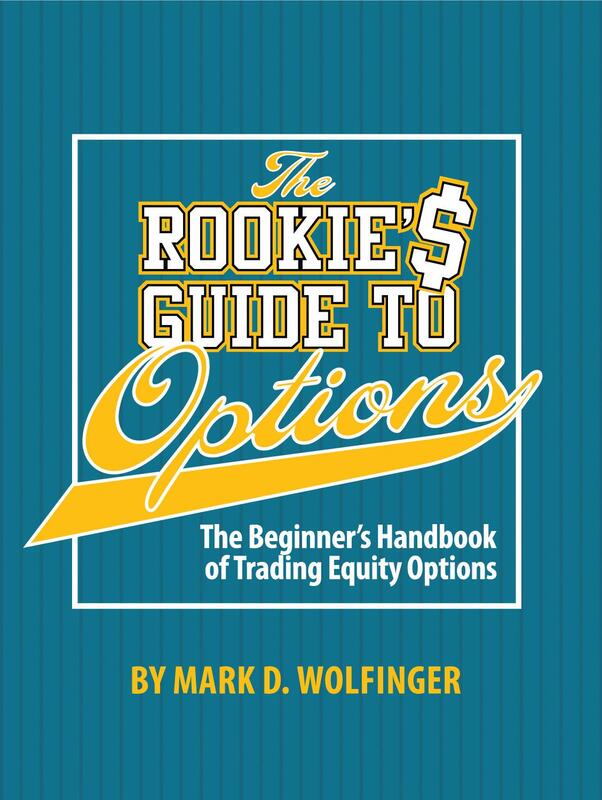 The Rookie's Guide to Options: The Beginner's Handbook of Trading Equity Options. The Rookie's Guide contains all you need to know to successfully begin trading options - with reduced risk. 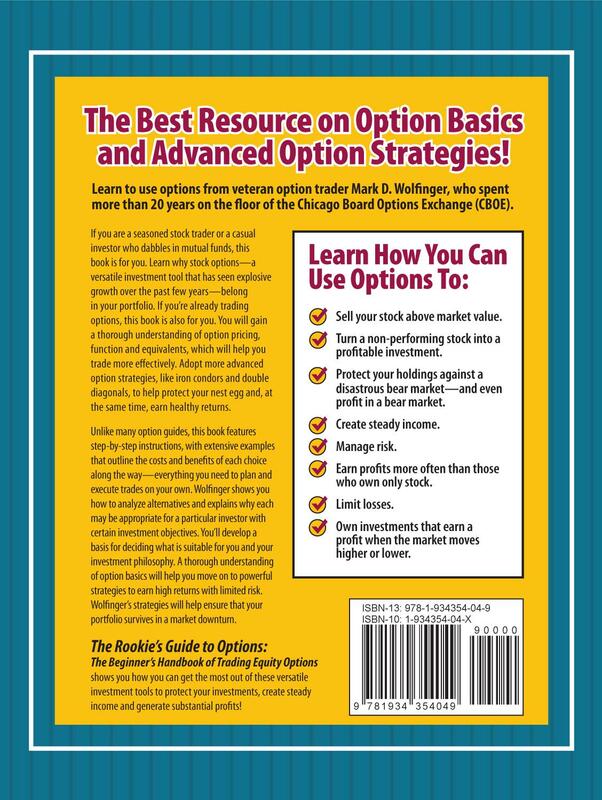 The Rookies Guide to Options is an introduction to options (including the essential information that many authors omit) for people with little or no experience using options. You will learn six basic strategies that enhance your investing profits. But, more importantly, you will discover how to maintain the value of your portfolio by learning how to adopt important risk management techniques. This book will be useful for years to come because it includes some advanced topics, allowing you to increase your options knowledge, and thus, your profitability, as you gain the benefits of trading with (rather than without) really understanding why you are making and losing money. Yes, losing money. Do not expect that every trade will be a winner and that every month will be profitable. But if you follow our advice, the odds will be in your favor and your bankroll should show steady growth year after year. Amazon.com offers The Rookie's Guide at the best available price. Sometimes you must choose a supplier other than amazon itself to get the best price. The publisher (W&A Publishing) is your best price when amazon is pricing the book over $34. Click image to enlarge cover. Click new image to read back cover. Or, you can buy the book at Amazon.com. The Rookie's Guide to Options provides the investor with a thorough options education. It contains everything you need to know to begin making money with options. Many strategies can be used when trading options. To succeed over the long-term, risk management is an essential skill. The Rookie's Guide explains how to manage the risk of each strategy, making it much more likely that you will keep your profits. How to select options that suit your investment style and tolerance for risk, allowing you to find, and remain within, your comfort zone. How to choose which specific option to trade for a given strategy. How to adjust a position, when necessary, to reduce risk. How (and why) to consider buying portfolio insurance - before it's needed. We don't just show you how to use a strategy and then leave you stranded to figure out what to do next. The Rookie's Guide to Options shows you how to think about a position. How to make the initial trade, how to adjust (if necessary) and how to close a position. If you trade index options rather than options on individual stocks, The Rookie's Guide to Options explains the crucial characteristics of these European style options that makes them very different from the more common American style options. We'll show you the simple step you can take to eliminate the extra risk associated with trading index options. The methods taught are used by both individual and professional traders, including hedge funds managers. One of these strategies is the 'iron condor,' a method that's currently very popular among professional advisors and hedge funds. You can easily find managers eager to take your money to apply this single srategy, allowing them to charge high fees (20% of the profits plus a 2% management fee). You'll learn how adopt this strategy on your own and save those fees. The common denominator among these six strategies is that are all used to increase trading profits while reducing the risk of being invested in the stock market. These methods are less risky than simply buying and holding a portfolio of stocks or mutual funds. Does this all sound too good to be true? It's not. But, there's a tradeoff. In return for limiting risk you must also be willing to accept a limit on potential profits. But, the profit potential is sufficient to satisfy most investors. The peace of mind that comes with limited losses makes this tradeoff worthwhile. Throughout the book, we stress the importance of managing risk, and thus, limiting losses. I'm not referring to anything like stop-loss orders. No. You'll learn to use options and money management skills to earn good profits when all is going well and to keep losses small when they are not. It's easy to make money using these methods. The diffficult part is keeping those earnings - and that's why it's important to understand how to manage risk. You can read more about our investment philosophy regarding options. These methods are not for every investor. But, if you are seeking long-term capital appreciation, if you recognize the importance of protecting your holdings against a market debacle, if you are ready to add options to your arsenal of investing tools, then The Rookie's Guide to Options: The Beginner's Handbook of Trading Equity Options was written for you. Or order from Amazon.com, or your favorite bookstore. Comments and questions welcome. We value your privacy and will NEVER give out your e-mail address to anyone, for any reason.